Happy Friday! We had a nice week, hope you did as well! I have a co-author of sorts for this post, as my husband is sitting here while I write this...and I can't resist posing these questions to him too! Never! Okay, maybe if you offered me a gigantic sum of money...and only for a day or two. Ha. Actually, I'd probably just be bored. I've experienced many worse things than memorizing the periodic table of elements or being snubbed in the lunch line by some juvenile queen bee. Husband's response to this question: "No." Me: "That's it? No more reflection than that?" My husband says..."You set the genie free! Didn't you learn anything from Aladdin?" Snort. Then, "I want to know what you wished first, because that would effect my wishes." My response: "No, it's just you in a vacuum wishing." Husband: "Then I wish to be out of this vacuum!" I'd try to come up with two big wishes that would impact the most people at once...change the way the world works for the better. Any ideas? Hubby says Scooby Doo, too. Right now, it's coffee for hubby and I! For me...followed closely by tea. I'm such a caffeine addict! I'm working on my attitude...trying to be more relaxed, positive and faithful. Ever look back and realize that things have a way of working out okay in the end? Trusting in God's plan is very freeing. Husband's response: "My fatness." Ha! He is not fat, by any means...but hitting his teenage weight is probably the only part of high school that he'll ever revisit. 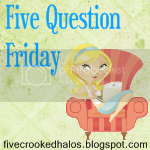 For more 5 Question Friday, please visit Mama M's blog...lots of fun posts to read today! I love how you guys participated in this together!!! How fun! I was really excited when Emily fell in love with Scooby-Doo! We even bought the characters and their Mstery Machine to play with! FYI - There is someone here in burnsville who painted their van to look just like the Mystery Machine! When we would drive by the house EMily would get so super excited!! !